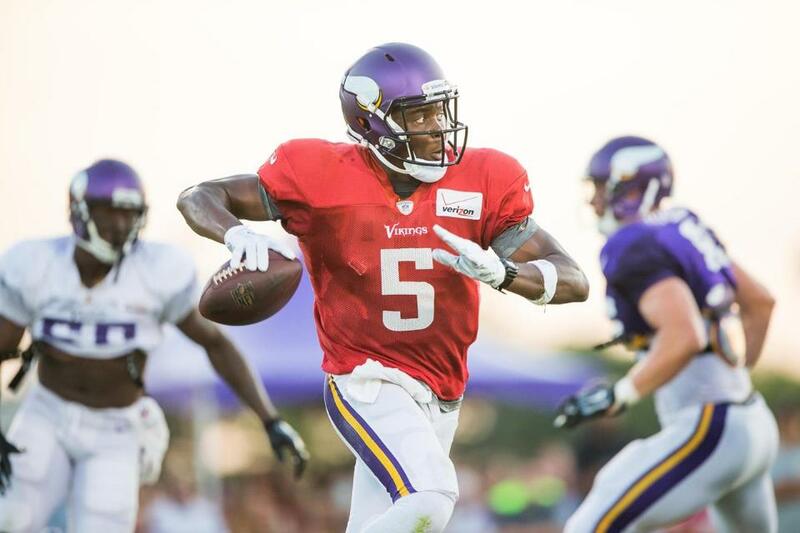 The Vikings worked hard in front of 10,300 fans at the night practice in Mankato, MN. Daniel House takes you inside his notebook for all the notable events from the night session. Over 10,300 fans were on hand for the Vikings annual family football night at Blakelsee stadium in Mankato, MN. The team ran through some goal-line work, a red zone period, and more team drills. The players were feeding off the energy of the crowd and there were many takeaways from the night practice. Teddy Bridgewater continues to perform well in training camp and looked fantastic in the night practice. In the team drills, Mike Wallace ran a corner route on Terence Newman. Newman covered him well, but Bridgewater threw a pass into a tight zone and Wallace made the tough contested catch. Later in the session, Bridgewater found Jarius Wright in the flat, who made a tough catch and great adjustment over Trae Waynes. His most impressive throw came in the red zone period when he squeezed a pass inside a tight gap to Charles Johnson over Xavier Rhodes. Bridgewater was consistently throwing quick passes over the top of the defense in small spaces. He handled pressure well and stepped into the pocket when everything collapsed. Bridgewater escapes out of the pocket very well and keep his eyes up the field to find the open receiver. During the night practice, Shaun Hill really stole the show under the lights. Cordarrelle Patterson ran a perfect corner route over Antone Exum and Hill muscled the pass into the gap. He followed it up by dropping a pass over the top of Marcus Sherels to Stefon Diggs. He perfectly adjusted to the pass and hauled in his second contested touchdown in two practices. Hill still didn't look fantastic on passes towards the sideline, but it was much better than any day thus far. Adrian Peterson took one carry and the crowd was on their feet to show their support of the veteran running back. He continually took hand-offs and accelerated to the outside, while making some excellent cutbacks in traffic. The fans were very receptive to his return and chanted "MVP" almost every time he touched the ball. Peterson continues to look ready to get into a game and pounce on every linebacker in sight. Jerick McKinnon is so fantastic at staying low to the ground, while making a smooth cut in the second level. He made two excellent moves on Gerald Hodges and Chad Greenway and is using his athleticism as an advantage. He still struggled in pass protection and lost two of his four battles tonight. The coaches are still working with him on his punch, but he is showing slow growth every day in this avenue. Charles Johnson continues to find ways to get open on the field. He uses his crafty route running skills to gain separation in the secondary. Johnson changes speeds and uses excellent footwork to stop on a dime and make tough catches. He hauled in a fade from Bridgewater and made a diving catch across the middle on Xavier Rhodes. Both of these catches were heavily contested, but he still managed to adjust his body to haul in the pass. Every time he hits the practice field in Mankato, Stefon Diggs flashes his abilities as a wide receiver. Diggs won another contested battle against Marcus Sherels in the end zone. He added another leaping catch on a post with Antone Exum Jr. draped all over him. Diggs is continuing to show he can get open and handle the physicality that this league has to offer. Corrdarelle Patterson made two very difficult catches in team drills and nearly hauled in a touchdown on a fade, but Jabari Price knocked the pass away as he came to the ground. He is still finding ways to get open and handled his first challenge under the lights very well. For the most part, Chase Ford performed well in the pass protection aspect of practice. He was only beaten once and managed to handle pressure very well. Kyle Rudolph didn't have any problems either and MyCole Pruitt was only beaten on one occasion. Brandon Bostick probably struggled the most to handle the pass protection side of the game and was beaten twice in three reps. As a whole, the group is performing at an average level in pass protection. In the passing game, Rudolph hauled in two tough receptions in the red zone drill and ran the most crisp routes of any tight end in the individual work. Rookie tackle Austin Shepherd looked impressive as a run blocker and paved an impressive lane for Jerick McKinnon in the second level. He also handled the 1-on-1 drills very well and the coaches praised him for his technique. Shepherd continues to be a player who is getting better every day with more repetitions. Brandon Fusco simply isn't being moved at the line of scrimmage. In team drills, he put Tom Johnson on his back and followed it up with a beautiful blitz pickup of Anthony Barr. He is adjusting well to the left side of the offensive line and will be relied upon to help Matt Kalil this season. Tyrus Thompson didn't look very impressive tonight and was beaten in 1-on-1 drills for the first time in training camp. He was slow out of his stance and didn't get quick initiation with the defensive lineman. Thompson looked better in the red zone and team packages, but took a step back from an individual standpoint. In the 1-on-1 drills, Matt Kalil was absolutely spun around by Anthony Barr. Kalil continued to have problems handling the defensive lineman. He didn't look as bad in the team setting, but Everson Griffen still managed to blow past him twice. With Carter Bykowski missing time, David Yankey worked at left tackle today. Mike Zimmer said the offensive lineman will continue to rotate to see which position is the best fit for each of them. Scott Crichton is showing that he made strides in the off-season to improve his game. He couldn't handle the physicality last season, but he passed the test again tonight. Crichton saw a few snaps with the first-team at left defensive end in pass rushing situations, but has played more exclusively with the second-team. He was causing havoc in the backfield by using an inside swim move to reach the pocket. In a real game, he would have notched at least one sack and he added to his performance by making a run stop of Matt Asiata near the line of scrimmage. Run defense might be the most impressive attribute of Crichton's game right now. Linval Joseph continued to win every 1-on-1 battle and has been outstanding in this drill. Joseph bull-rushed John Sullivan to the ground and he is quicker off the ball this season. He looks more lean in his frame and it seems as if he finally might be healthy this year. Eric Kendricks saw some mixed reps with the first team in the nickel package. He took advantage of these snaps by corralling two defensed passes in tonight's practice. Kendricks knocked away a pass intended for Chase Ford and poked away a throw across the middle to Adam Thielen. He has the ability to cover very well in the nickel package and the team is giving him a chance to earn his keep with the first-team defense. Chad Greenway added a pass defensed on a wheel route to Kyle Rudolph. Greenway had excellent position and prevented Rudolph from being in a spot to make the catch. Gerald Hodges saw a few snaps at middle linebacker, but spent the majority of practice working on the outside. He struggled in the run game tonight and couldn't get downhill twice in the running situational drills. Hodges still has looked impressive in training camp, but tonight wasn't his best practice. Tonight, Trae Waynes took an encouraging step forward in his development as a cornerback. He defensed two passes in the red zone and the no-huddle drill. The most impressive came on a pass thrown towards the corner of the field. Waynes read Shaun Hill's eyes and timed his leap to knock the pass down before it cleared his head. In individual work with the wide receivers, Waynes sealed off Wright from catching a pass and knocked away another. Jerry Gray praised his technique, but was very vocal with Waynes that he wants to see him make more plays on the ball. Nonetheless, he was in position tonight and his physicality was much improved. Charles Johnson might have beaten Terence Newman twice tonight, but he still managed to challenge every pass in his direction. In fact, he managed to knock away a fade intended for him in the no-huddle drill. Newman later saw a snap in the slot and deflected a pass intended for Adam Thielen. It was encouraging to see both Waynes and Newman take another step as they begin to install more of the system at training camp. All of the safeties besides Robert Blanton really struggled in coverage tonight. Antone Exum Jr. was beaten by Patterson and Diggs tonight, but he still managed to contest the throw. In no-huddle drills, Andrew Sendejo missed an assignment and left Adam Thielen wide-open on a post route across the middle. Anthony Harris poked away a pass across the middle intended for Chase Ford and got his name into the mix for the first time in training camp. In field goal kicking, Blair Walsh was 6-for-8, missing his final kicks wide left from 49 and 52 yards out. He hit the remaining kicks on a range stretching from 33-46 yards. Kevin McDermott and Cullen Loeffler split snaps tonight. McDermott saw the majority of field goals reps, while Loeffler saw more work with Jeff Locke in the punt game. Carter Bykowski, DuJuan Harris, Gavin Lutman, and Josh Robinson (pectoral) all didn't practice tonight. The Vikings will have one padded practice from 2:00pm-5:00pm on Sunday. Anthony Harris has had his name in the mix since OTA's. Those in the know have been praising his play since OTA's.